Less than a week after Sophia was finally diagnosed with Celiac, she was invited to a birthday party. Though I had already been gluten-free for about a year, navigating the gluten-free waters with a first-grader who got much sicker than I did when she ingested gluten was a little bit scary. I didn't know the little girl whose party Sophia was invited to, so I called her mom and explained about Sophia's new dietary restrictions. I found out that they would be having standard birthday party food: pizza, cake, and ice-cream—all of which usually contain gluten. I certainly didn't want to demand that she accommodate my child, so I offered to bring some gluten-free options for Sophia to eat so she wouldn't be left out. The mom was really nice when we arrived at the house, and even let me go into the kitchen to see if the ice-cream she had purchased was gluten-free or not (it was). I left Sophia there with a gluten-free brownie and a gluten-free bagel pizza we had made at home, confident that she would be okay and certain I had covered all of the bases. I was wrong. Sophia got "glutened" (as we like to call it) at that party and I felt like the worst mother ever for not doing more to protect her. There was a pinata, and the pinata was full of candy. It didn't even occur to the party girl's mom to check whether or not the candy was gluten-free, and honestly, I wouldn't have expected her to. I know what it's like to run a party with a bunch of little girls, and worrying about special diets would be the last thing on my mind by the time I got to the pinata. So Sophia ate a bunch of Kit-Kats, which are full of gluten, and she was sick for a few days. And I've been pondering ever since how I can better deal with the whole birthday party question as her mom. But what if you are the birthday party mom, and you know that a gluten-free child is coming? Or a child with any sort of food allergies? Is there anything you can do to make things easier for the child? Let the decision of whether or not the allergic child attends a birthday party be left in the hands of his parents. Sophia has not been invited to a couple birthday parties because the hosts didn't know what to do about her dietary restrictions, and that's hard on a kid. Don't worry about the restrictions initially, because I guarantee you that the parent will contact you about it, and then plans can be made. Honestly, I understand if the party hosts do not really want to pay a million dollars to provide my daughter with a special pizza that costs triple what a regular pizza costs. I understand if they don't want to provide birthday cake or other treats that are gluten-free. That is why I contact the parents and offer to bring a gluten-free pizza or other GF alternatives to whatever is being served. Buying a GF cupcake for her at the local bakery (most bakeries nowadays have GF options). Having GF graham crackers available for S'mores making (marshmallows and Hershey's chocolate are GF). Asking for my favorite GF pizza crust recipe and making it (even though it required borrowing some ingredients from me). Changing the entire party menu from pizza to grilled chicken and veggies (healthier for everyone!). While these things are wonderful, they are unnecessary. I am happy to bear the burden of my own daughter's food sensitivities. So don't feel bad if these sorts of accommodations are impractical for the party you are throwing. Make sure that you let the parent of the allergic child know the ingredients of everything you will be serving at the party. This will allow them to approve or reject the food and help both of you to know if other plans need to be made. Usually, I ask the parents to call or email me when they know what they will be serving and we go from there. I then determine what Sophia can and can't eat and either offer to bring alternatives for her myself, or help the host to know which changes can be made to the menu if that is what they prefer. I cannot emphasize this enough. Do not assume that something is gluten-free just because it seems like it must be. Ice cream, as mentioned before, is a common birthday party food that often contains hidden gluten. Vanilla usually contains gluten, unless it has been labeled gluten-free—this is one that I did not realize until Sophia kept getting sick every time we made what I thought were gluten-free cookies. Gluten can be found in some pretty odd places, so make sure you run every single ingredient by the parents. I'm sure the same goes for children who suffer from nut allergies or other food sensitivities—these allergens hide very well! You can be confident that the parent is well educated on where gluten or nuts or soy lurk, and will help you know which ice-cream to buy or loan you some vanilla from their own pantry. And don't forget the little treats included in party favors or pinatas! Ask ahead of time which candies are safe and make sure they are available at the birthday party. Finally, don't be offended if the parent chooses to go ahead and provide food for their child themselves—even when you offer to make accommodations. It's just that we can't be too careful, and sometimes it's just easier to be the one in control so that we know exactly what our child is eating. Celiac kids can get really sick, but in general, their lives aren't in danger. However, someone with a severe nut allergy that could go into anaphylactic shock is something I wouldn't want to play around with. I'm fine with a parent providing their own food in these cases because it gives me peace of mind, too! Also, don't be offended when the parent wants to stay at the party to monitor what their child is eating. It really is scary not to be in total control when you know how sick your child can become if she eats even a little bit of gluten. I don't want to have to make the party parent worry about my child if it's easier for me to just stick around and help out with something I do on a daily basis anyway. In the two years since Sophia's original diagnosis she's been to many more birthday parties. She's still been accidentally glutened once or twice, but for the most part I feel like I know how to deal with this situation much better than I did in the beginning. It's totally possible for kids who have dietary restrictions to attend birthday parties and have a great time without having to worry about the food. So go ahead and throw that birthday party and don't be afraid of inviting the gluten-free (or peanut-free, or dairy-free) kid. Everything will work out just great! Looking for other great gluten-free tips and recipes? This is wonderful article Lara. I will be sharing it with the mom's of gluten free children that I know. Thank you! Thanks, Lara. We've come across this situation many, many times. I do what you do. I call ahead and ask what is being served. Then I send my daughter to the party with something gluten free that somewhat matches what everyone else is having. I have had some parents provide special things for my daughter, but it's not really necessary. (Especially when you have a super picky kid like mine. I hate to have someone spend a fortune on a gluten free treat that my daughter will only taste and then throw away later.) Great post. Thank you! What a great idea! Pinning this for sure! Yes. I'm very happy to bring the food--I'd be feeding her anyway, so it's no big deal. But I do appreciate those who are willing to go out of their way to make things work so she doesn't feel different. I appreciate this article, as I'm just learning to handle this. 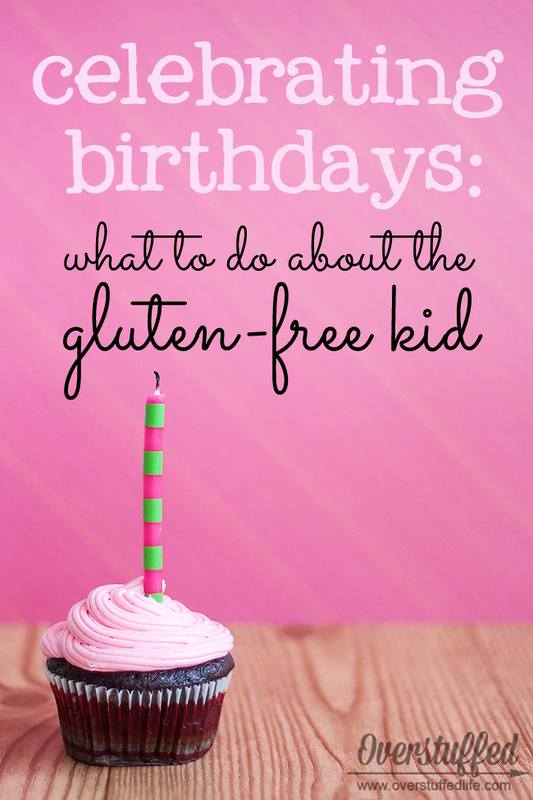 A related question I'd love to know how you address: what do you do when your gluten free kid is the birthday kid? 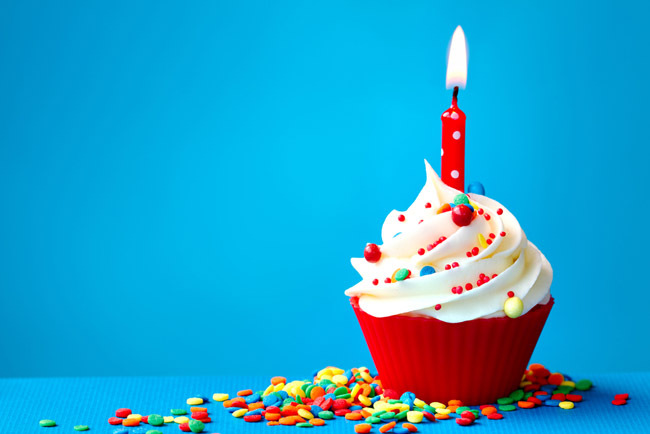 I can't afford to provide gluten free baked goods for all the numerous family members and friends who want to celebrate with us, but my kid doesn't want something he can't eat served at his own birthday party. How have you handled parties for a gluten free kid where nearly all the guests are not gluten free, and also think it's weird or scary? Generally I bake two birthday cakes--one from a GF mix, and one regular. Or two batches of cupcakes, etc. I try to make them as exactly the same as possible so that it doesn't feel different for my daughter. Any other party treats are all things that would be gluten-free anyway so I'm not spending money on specialty items. Things like pudding, veggie trays, and GF candies work. This was a great post- my son is a 3rd grader and was diagnosed when he was 15 months old, so we've been doing it for a long time.... I always have GF cupcakes in the freezer and then I can send one with when he's invited to a party... all of his school friends/teammates totally get it now and it is terrific, but it is a lot of me offering to provide food- as long as he's safe I guess that's the most important! I find that when I offer to bring the food, the parent often immediately says they'll do it themselves and ask where to get the food. It is a good way to break the ice and not sound demanding! I don't mind bringing things at all, and some parents appreciate that I will do it. Either way--as long as she's safe, just like you say!